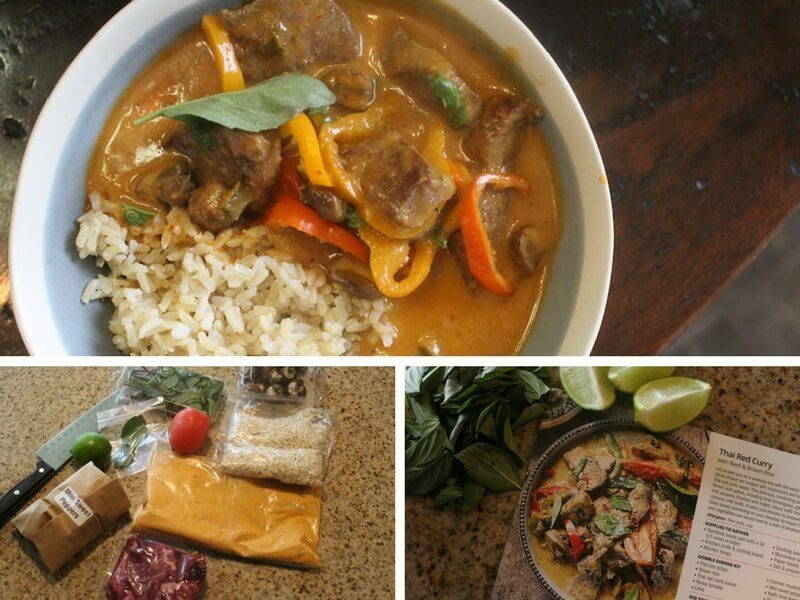 Gobble Meal Kit Review: Fast & Fresh, But Are They Good Meals? Gobble was the fastest meal kit service I've tried so far in my quest to try all of them. Pre-made, tasty sauces are the key to making meal prep fast. With Gobble, you still have to prepare the fresh ingredients like veggies, rice, and meat, but it's like a “color by numbers” version of dinner time. Though I enjoy the cooking aspect other brands, if you are pressed for time during the week and want some delicious, fresh meals to have (almost) ready to go, Gobble is your best bet. Get 50% discount through this link or keep reading for details on which meals I tried, how they turned out, and how other meal kit options compare. Ordering from Gobble the first time was a relatively easy process compared to some other meal kit services that I've tried. Just 2-3 steps, and my meal was ready to ship. I even got a choice of shipping dates, which was made clear before ordering. My only frustration, as per usual with meal kit deliveries, is that they want your contact info first. I'd like to be able to browse the menu first, and decide if the food looks good before I give you my credit card details. Gobble meal kits look delicious, and there are lots of options each week. Order early, because the popular ones can sell out if you wait too long! 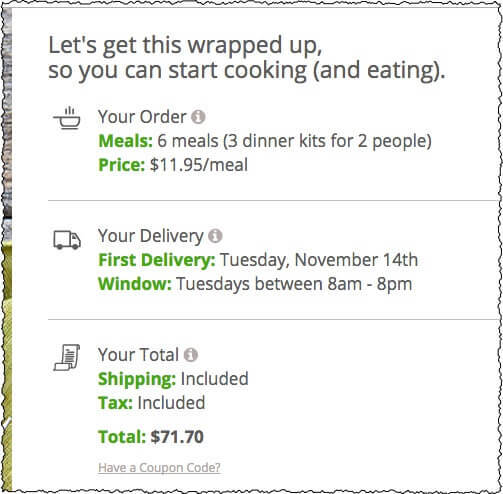 Note* Gobble labels their meals as $11.95-$13.95 per meal, but in most other meal kit services, they call this a “serving”, and the full portion for the kit the “meal”. Gobble is priced very similarly to most other meal kits, which usually fall into the $9 – $15 range depending on the brand and the recipe ingredients. My total bill for this first week was $71.70 including shipping. Unfortunately, I couldn't find a discount for my first week as with many other of my favorite services like Plated or Sun Basket. Something that makes Gobble unique is that they have “additions” that you can supplement your meals with. These include desserts and lunches – small items that can make a meal larger, or turn into a reheated lunch the next day. Treat yourself! I think easy lunches like the Thai curry chicken soup I ordered could be really useful for one or two days a week when you are super busy or just feeling lazy. 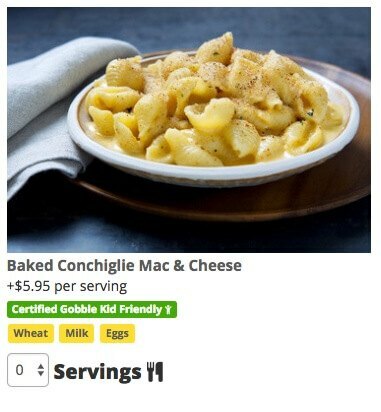 They also have some kid options like mac ‘n cheese, if you want to order something spicy for the adults like curry and little Timmy can have noodles with sauce or something “kid friendly”. You can also add more servings per meal…up to 12 servings! This makes it great for families. There aren't that many family-friendly meal-kit services out there. Services like Blue Apron have an option for a 4-person family, which is the typical American household, but larger families are also quite common. If you fit into that category, Gobble is an awesome option. Hey, that could work for catering too! With friends coming over Friday or Saturday night, you could impress them with a fancy meal kit. The box from Gobble arrived on time, and cold. This seems pretty standard for meal kit services, since I've tried about six as of the writing of this post, and haven't had any issues. In fact, the only problems I face from time to time is leaky packages, and this time was no different. 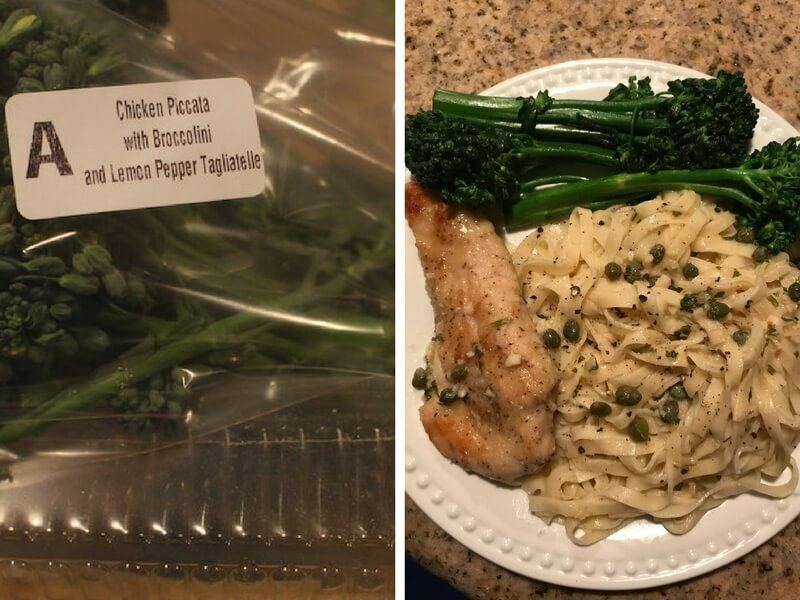 The chicken package from the Chicken Picatta leaked a bit, so I had to rinse it and put it in my own Ziploc. What's always interesting to note is how the services decide to package the meals. So far, Hello Fresh does the best. They have nicely designed bags, with everything separated out per meal. Peach Dish was rather unimpressive, wrapping their meals in material that reminded me of dollar-store grandma lingerie. Many, like Green Chef, simply dump everything into the box and let you sort it out. With Gobble, everything was sorted by meals, which was nice, but the bags were a simple plastic ziploc bag with a sticker indicating which meal it was. Practical? Yes. Enticing? Not really. 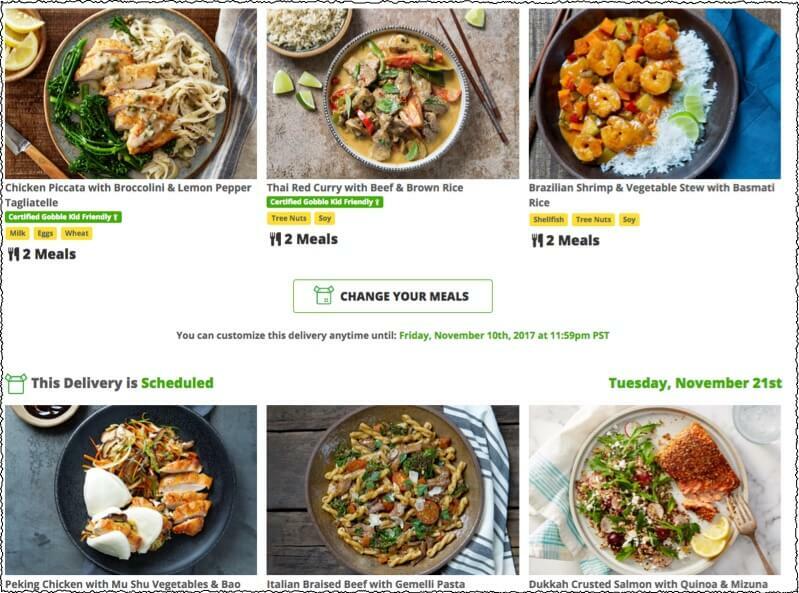 I just have a huge list of these meal kit delivery services, and am trying them out one by one. I didn't really pay attention to the Gobble website, with the slogan of “Dinner kits designed for 15 minutes with 1 pan”. Well, that's pretty much what they were, so Gobble delivered on their promise! There are advantages and disadvantages to this. The advantage is, obviously, that the meals are super easy to cook. The rice is pre-cooked, the noodles need just a couple minutes to fluff up in hot water, and all the sauces are already made, then sealed in bags. The food was tasty, and it took very little cooking skill to understand the instructions and whip up a meal. For a busy mom, these would be perfect. For a single dude that doesn't like eating out and wants to start learning some basic cooking skills? Also great. For an experienced cook that likes to enjoy taking his time cooking, the Gobble falls kind of flat. I feel like I'm cheating when the curry sauce I'm making involves just cutting open a bag and dumping it into a saucepan. But this is what makes Gobble unique, and perfect for a specific kind of target market. Rather than spend 45 minutes cooking a complicated meal with 10 sets of instructions, you can basically just toss everything together and be ready to eat very soon. This is much healthier than eating out or eating TV dinners, but takes much less time than cooking a meal from scratch. It's also a lot tastier than the “one pot meals” you probably make up when you don't feel like cooking anything particularly inspiring. I love curry, so this was my favorite meal. Adding fresh basil and lime to a curry sauce is an amazing thing. I felt this sauce was pretty heavy though, and not spicy at all. I like a little kick to my curries! My girlfriend is a picky eater, so with all these crazy meals like the stuff from Plated (that I love), she'll usually have about half of a serving and be done. I know she likes a meal when she takes the leftovers for lunch the next day then texts me how good it is. I guess she was a fan of this one! I'll have to save the recipe card. The star of this meal was the chayote! That's the big green vegetable that you see in the picture. It's an interesting one because it's kind of a cucumber type vegetable in that it's got a very plain flavor, and seems like it's just full of water. But when cooked, it absorbs the flavor of whatever you make. This created a juicy, flavorful, crunch “fruit” (more like a vegetable IMO) that went well with the sweet and sour Brazilian sauce. Canceling Gobble was relatively easy too. Unlike some companies that require you to email them, or even call them on the phone, you can cancel online through your account. They do make it a little hard to find, but if you can make it to their FAQ, you can find the cancellation survey. Otherwise, just type in Google and the first result will take you where you need to go. As mentioned above, obviously, Gobble is a little different than many other classic-style meal kit deliveries. The best example would be Blue Apron, which sends you a big box of veggies, meat, spices, and other goodies. Blue Apron is a bit of an extreme example, with everything tossed together in a box and you have to organize it yourself. Actually, I really enjoyed the meals from them, but organization and preparation does add at least 10 minutes extra to dinner prep. The style of Gobble, what I call “15 minute prep” meal kits, is quite similar to Munchery, though I didn't enjoy their meals as much. The price range is similar too, so it's really just a matter of what your flavor preferences are, and this may vary from week to week depending on what's on the menu. Alternatively, if you can stand to do a little bit of food prep (but not too much), Home Chef was an easy-to-prepare meal. The tasty creations from this company were straight down the middle in terms of all metrics: price, flavor, choice, and prep time. It's a good one to start with if you're unsure of what company to choose. My personal favorites are Sun Basket and Plated though! Sun basket had some truly unique meals that went above and beyond any other meal kit out there, but you definitely pay extra for that brand. Plus, they took forever to cook. Plated was able to achieve powerful flavors and unique dinner ideas while costing a bit less, which is why I picked them as my own favorite. Where does Gobble fit into all this? Gobble is a lot faster than most meal kits, but a little more expensive for the convenience. They also offer a lot more variety than some of the other, more basic brands out there. Since they also offer meal additions and lunch add-ons, they are also highly customizable compared to some other brands. Considering you get a 50% discount when you sign up through the links on this page, it's at least worth trying for a week to see if you like their current (and near future) selections. ==> Sign Up For Gobble Here! 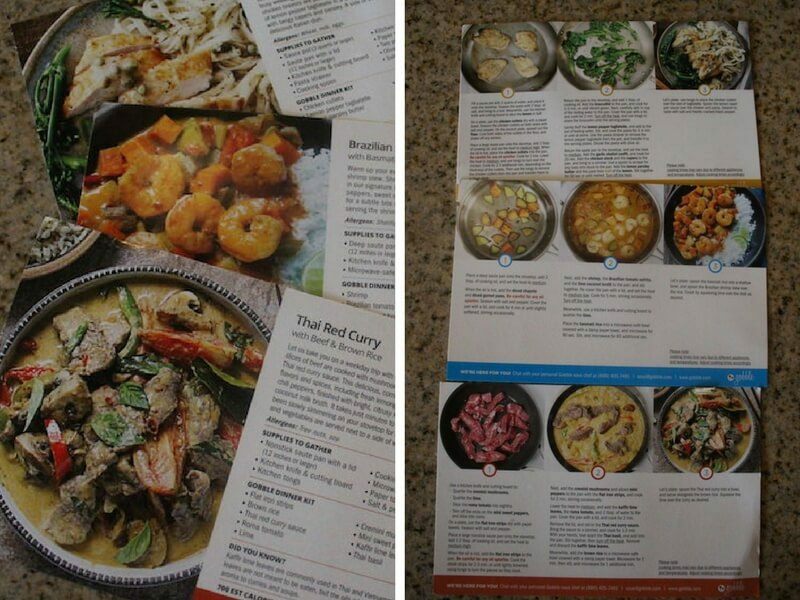 You are here: Home / Blue Apron / Gobble Meal Kit Review: Fast & Fresh, But Are They Good Meals? I am looking at Gobble because I am looking for something with very little prep. We tend to order out a lot, but it’s so unhealthy. I suffered a brain injury 4 years ago and grocery shopping and cooking with too much prep makes me very disoriented. I usually have to lie down after making dinner. I was looking at Plated and Sun Basket as well, but Gobble seems to chop everything for the meal. How do Sun Basket and Plated compare to Gobble for the prep. While I can do some, there are days I’m lucky I even stand without feeling like I’m on a boat. Thank you. Sunbasket and Plated require A LOT more preparation. In fact, those are the two most involved meal kits that I’ve tried. That’s probably why I enjoyed them so much. For less meal prep, Gobble is great, but so is Munchery. Hello Fresh is pretty easy as well, but not as easy as the previous two I mentioned. 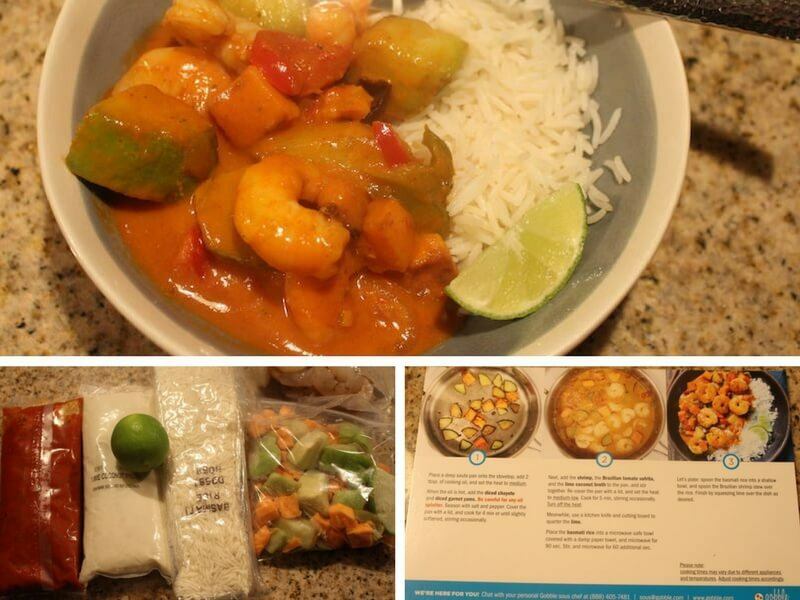 You could also consider fully prepped meals, which are delivered frozen (or sometimes fresh). They are a bit more expensive, but require no prep, and there’s a lot more variety of companies to choose from. Gobble is not any easier than other meal services and definitely not one pan cooking. False advertising! What are you talking about LOL. It’s wayyyyy easier than any other service I’ve tried. All the sauces are pre-made! Ad companies run ads on competitors content. It’s common! I would give 0 if that was an option. Aside from the fact that the quality of the food is terrible, we tried to cancel our order and get a refund of our money. They canceled our order but would not refund our money since we should have canceled by last Friday, when we received the food on Thursday. ONE NIGHT is not enough time to try a company out. Unacceptable. In addition, we were sent two of the same recipe cards instead of the third card needed and one of our meals was missing an ingredient. Hello Fresh is a MUCH BETTER company, in every aspect. Quality of food, reliability and customer service.